Thermacell repellent devices protect you and everyone around you within a 20m² area. No need to use smelly, harmful sprays or oily lotions. The technology uses heat to disperse a repellent into the air creating a zone of protection from those pesky mosquitoes, midges and other small flying insects. Now that's what we call freedom to enjoy the outdoors. Burton McCall will be on stand 56 or contact customer services for more information 01162 344646. "The process is never easy," explains BD Athlete Alex Honnold. "And sharing your vision can be scary. But developing a game-changing product is always worth it." 30D Ultra-Sil® is a 30 denier 240T Nylon made from a high-tenacity Cordura® brand yarn. High-tenacity nylon is stronger and more abrasion resistant than standard nylon fibres. If that works on the Scottish uber-midge I'll eat my DEET. Having given this a spin on Skye the other week when the midges were probably 8/10 (i.e impossible to be around without a headnet, with plumes/clouds of them forming around you), I can honestly say that there was no way that this device was ever going to stop them in their tracks - there were simply too many. It was the same sort of conditions that Smidge and DEET have zero impact too, because it's not necessarily about the biting - it's the sheer number of them swarming around you (it was so bad Dan had a coughing fit from inhaling too many). What I'd be interested to see is how it performs when conditions are a little less severe, say 4-6/10, as I can see that being more realistic. When you get to 8-10/10 you're basically resigned to running away, hiding, or just accepting the end of days and giving in to it all. I'd echo all Rob's comments. When it's really bad then nothing works, and to date I'd say this includes the Thermacell. Perhaps it thinned out the numbers, or maybe not - there's no way of telling when you're engulfed in clouds of them. I have yet to trial it in more manageable midge conditions. 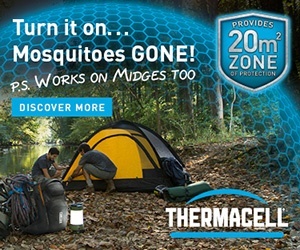 It surprises me that the midge eater people haven't developed a camping stove sized portable unit.